I borrowed a couple of books from Robert Weinberg of Virgil Findlay’s illustations. I thought there would be something there to create new bookmarks — perhaps 4 per year? — and I was not disappointed. I plan to use them as premiums for book purchases from The Battered Silicon Dispatch Box, and they will have a limited run changing every year. On the facing page of the Virgil Fndlay volume was another illustration for “Sexton, Sexton, On the Wall” a story by August Derleth which appeared in Weird Tales, January 1953. this story subsequently appeared in Lonesone Places (1966, Akrham House) without an illustration. Now I pose the quetion — How many other times did Virgil Finlay illustrate the work of August Derleth, and I will leave the answer to the readers of this post, and invite dialogue. I know VF illustrated “Roads” but although that was an Arkham House publication in 1948, it was written by Seabury Quinn. I attach all three illustrations by VIrgil FInlay, as additiional eye candy for the reader. 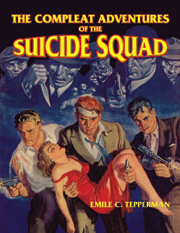 Another Lost Treasure that is on the verge on going to press is The Compleat Adventures of the Suicide Squad. These are the escapades of 3 American gentleman, a blond, a red-head and a dark haired fellows who go through life before and during the Second World War rescuing blond ladies, usually in a red dress from impossible situations from dastardly villains. This is not enduring literature for the ages, but it was a great escapist literature for our grandfathers. The Boche don’t fare very well, and there’s a great poster of the Squad defacing a propaganda poster of Adolf Hitler. The Japanes fare less well, with Oriental thugs being decimated en masse, with never a scratch nor injury to the members of the Squad. There are a total of 23 stories, almost all appearing in Ace. G-Man Stories. You can check out the website at: http://batteredbox.com/LostTreasures/17-SuicideSquad.htm. There are also a great batch of covers to illustrate the Dustjacket, and the internal illustrations are full of action. The project will go to press, just as soon as Robert Weinberg completes his introduction, and with a bit of publihser’s luck, it will be ready for Pulpfest in Columbia, Ohio at the endof July! This week has been challenging. I have rediscovered all the Lost Treasures that I had been working on, before I was appointed Editor of Arkham House Publishers by April Derleth in February 2009. Now that is not to say, I haven’t been working on all of these projects in the interim, but none of them has gone to press for a variety of reasons, mainly because I was developing projects with Bob Weinberg to re-establish the Arkham House forthcoming list in a definitive manner. To answer the question I have been asked many times since March 21st 2011 as best I can — Arkham House is in transition. Now about these Lost Treasures. Where do I start? Well let’s start with yesterday. I worked through the fully proof read galley of The Satan Hall Omnibus, and inserted all the illustrations and covers where applicable. The galley grew to 538 pages, and Bob Weinberg is going to write an Introduction. There is some great eye-candy and I will provide some representative illustrations below. These 24 stories by Carroll John Daly can hardly be described as great literature. They appeared between 1931 and 1954 in a series of Pulp magazine including Detective Story Magazine, Black Mask, Detective Tales, FLynns. New Detective, Black Book Detective and finally Famous Detective. They all can be described as great reads, and provided escapist reading for our grandfathers before there was television, the internet and iPads.